Last week, a report claimed that Ford was plotting a new performance Mustang to slot between the entry-level EcoBoost model and the V8-powered Mustang GT. Sadly, it isn’t reviving the Mustang SVO nameplate as we hoped. Instead, Ford has unveiled a new 2.3L High Performance Package for the entry-level Mustang EcoBoost to replace the former 2.3-liter EcoBoost Performance package. Available on the entry-level Mustang EcoBoost fastback coupe or convertible models this fall, the new High Performance Package adds a unique EcoBoost engine powered by Ford Performance and upgraded handling components from the Mustang GT Performance Package. The car began as an experimental project in the Ford Performance garage developed by a team of five. The design-to-approval process for the 2.3L High Performance Package took less than ten months. Under the hood is Ford’s most powerful EcoBoost engine yet. Taken from the discontinued Focus RS, the 2.3-liter EcoBoost engine has been tuned to deliver 330 horsepower and 350 lb-ft of torque, a 20 hp increase over the standard Mustang EcoBoost. Ford says this makes it the most powerful four-cylinder sports car offered by an American automaker. The new performance package also adds a five percent larger twin-scroll turbo compressor, a larger radiator, and an engine recalibration to run both Ford’s 10-speed SelectShift automatic and six-speed Getrag manual transmission. Ford Performance has also enhanced the soundtrack with an active quad-tip exhaust system. With these upgrades, Ford says the new High Performance Package will enable the Mustang EcoBoost to hit 0-62 mph in around 4.5 seconds on premium fuel, with top speed increasing to 155 mph. That's a 10 mph gain over the 2019 EcoBoost Performance Package and 34 mph faster than the base EcoBoost Mustang. To sharpen up the handling, Ford Performance has added an alloy strut tower brace to stiffen the chassis at the front, while larger four-piston fixed calipers with 13.9-inch front rotors from the Mustang GT improve the stopping power. New performance calibration tuning is applied to the electronic-controlled power steering, antilock braking, stability control and five driver-selectable drive modes A 3.55:1 limited-slip rear axle is also included to improve the cornering, along with an exclusive set of 19-inch aluminum wheels and 255/40R summer tires. Numerous exterior enhancements included in the EcoBoost 2.3L High Performance Package give the entry-level Mustang a more aggressive appearance, including a large black front splitter and belly pan, and brake cooling ramps from the Mustang GT Performance Package that reduce front-end lift and improve brake cooling. Elsewhere, the new performance package adds a blacked-out grille with offset Mustang tri-bar pony emblem, 2.3L High Performance Package side badges, and magnetic gray side mirrors, a raised blade rear spoiler, and a unique metallic gray stripe adorning the hood. 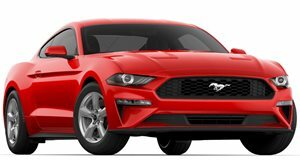 In addition to the new performance upgrade, all new Mustangs for 2020 will get FordPass Connect as standard equipment, while base-model cars gain new 17-inch silver aluminum wheels. Four new color options will also be available: Grabber Lime, Red Hot Metallic Tinted Clearcoat, Twister Orange, and Iconic Silver. Pricing details haven’t been revealed for the new entry-level performance Mustang yet, but the base EcoBoost Mustang starts at $26,395 and $31,410 for the EcoBoost Premium. The V8-powered Mustang GT, on the other hand, is priced from $35,355, so we're expecting the new model to slot between the Premium and GT’s pricing.